First off, it's Lorain, not Lorraine. Apparently, teachers' union hacks must be products of a system where educators aren't held accountable for actually teaching students, or in other words, Ohio's public school system. But aside from the poor spelling and grammar, the statement is straight up false. Of course, union hacks will focus on the bottom line, so let's just get this out of the way: yes, Lorain has less money today than it did a couple years ago. But that's where the facts end for union arguments. That's right, folks. Under former Governor Strickland, state funds to public schools were cut in his last two years. Under Governor Kasich, state funds to public schools were increased. That bears repeating: Governor Kasich increased state dollars to public schools. What the union faithful conveniently leave out is that the reason overall revenue went down is that Strickland relied on one-time "Restricted Federal Grants-in-Aid" from our Commander-in-Chief, or more commonly known as stimulus dollars. And not lightly either--to the tune of $4 million in 2010 and a whopping $7 million in 2011. Perhaps union hacks would like to instead point the finger at President Obama for not coughing up his share for public education? Because Kasich ponied up more than even his union-heralded predecessor did. 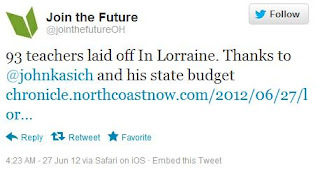 Of course, there's even bigger issues with Lorain schools. Especially given that they bumped teacher salaries and benefits when the stimulus dollars came rolling in, knowing they were one-time dollars. That's like getting a year-end bonus and buying a house--you may be able to afford the mortgage payment then, but down the road you'll be left struggling to make ends meet. It's just not good budgeting. Of course, former Governor Strickland knows a thing or two about poor budgeting, despite warnings of impending deficits. Perhaps union hacks would do well to stop pointing fingers, drop the campaign of lies, and give credit where credit is due for looking out for students. John Kasich increased state aid to public schools. You're welcome. NOTGVN - This is unusually misleading, even for this blog. The State of Ohio is providing 1.8 BILLION less to schools 2011-2012 than in 2009-2010. Thats not a small amount, and you left it out of your calculation. See Toledo Blade http://www.toledoblade.com/Op-Ed-Columns/2012/02/05/Schools-feel-state-budget-cuts.html and numerous other sources. "The budget provides $6.27 billion in FY 2012 and $6.31 billion in FY 2013 for foundation funding. In FY 2011, foundation funding totals $6.51 billion, including $515.5 million in federal stimulus money." So, once again, Mr. NotGvn, you are wrong. Except you conveniently forgot that schools receive state funding BEYOND the foundational funding number. And the minor increase you cite in foundational funding is offset by state cuts in school funding elsewhere as cited in the Toledo Blade story. In other words, your budget numbers only work if you don't actually look at the full state education budget. So some dude creates a twitter account to constantly promote the dying entity known as "unions", and decides to call it "Join the Future". If you looked at Strickland's first budget, the pre-stimulus one, then you'd see he funding public schools more than Kasich did. The stimulus was designed to keep state funding levels up as revenues dropped due to the recession. The idea being that when the stimulus ran out the State's could assume their level funding. 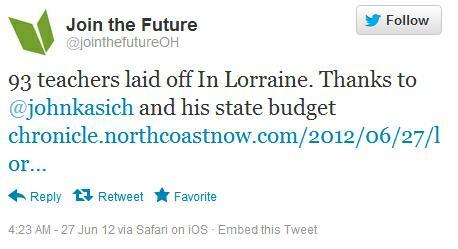 Kasich instead used the lack of the stimulus as an excuse to cut overall funding for public schools. It's not debateable if he did it. He did. Great article as always. I was so upset over the repeal of SB5...it was like everyone was blinded by the unions and their fancy contracts.